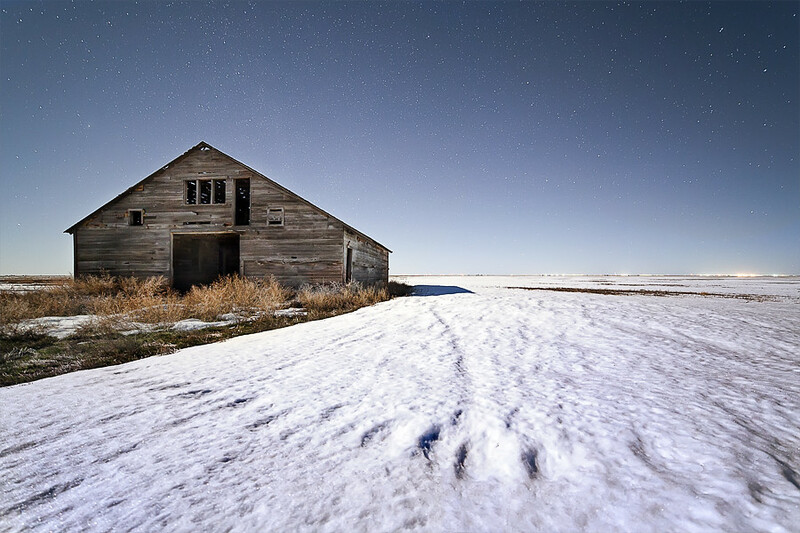 Ventured out into the frozen tundra of southwest Kansas last night in hopes of a grand show of streaking fireballs, blazing across the night sky….yeah, not so much. The moon must have bleached out most of the faint meteors and the two or three bright ones we saw were just out of frame. None the less, I had one of the better nights of shooting I’ve had in a while. It’s always tough to talk yourself into getting out in sub-freezing temperatures but last night was totally worth it. Shot a few star trails and had some great light with the setting moon. Did anybody else have check out the meteor shower, and if so, how was the show from your location? Another year has flown by and once again it is time to untangle the huge knot of christmas lights and throw them up on the roof. Decorating for the holidays is always something I’ve enjoyed doing. I try to set out a big display for halloween as well as for ol’ Saint Nick. 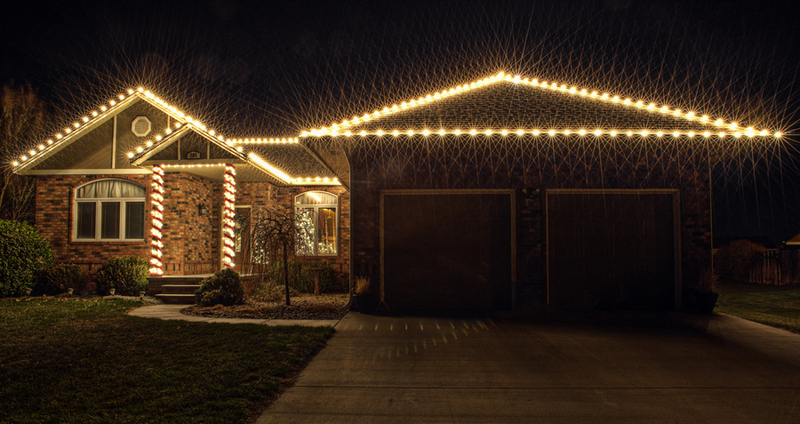 This year I added the candy cane appearance to the poles on the porch and my wife added a strand of multicolored lights to the front bush….what’s that, you don’t see the multi-color strand. Well, they were “accidentally” unplugged for the picture… 🙂 Hope everyone is having a great holiday season! Also known as the Andromeda Galaxy. 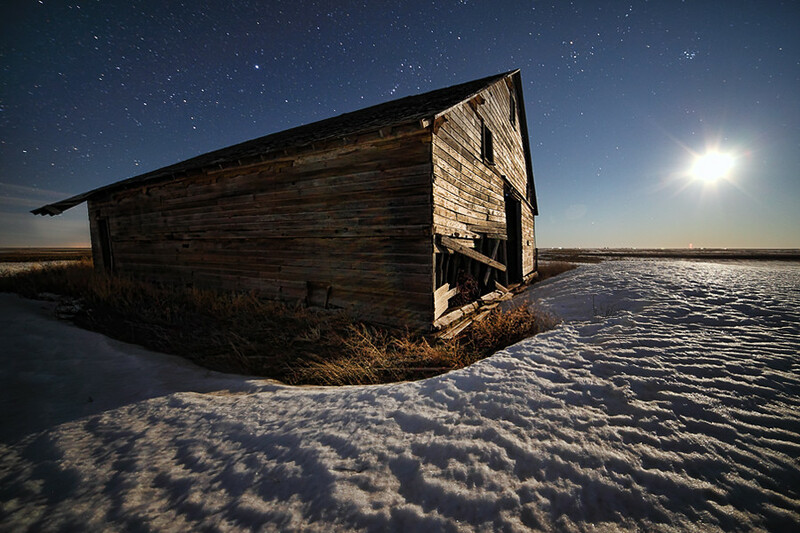 I took this shot on Monday night while out waiting for the northern lights to appear. When I initially arrived at my dark sky location, I didn’t see anything that resembled the northern lights, so I figured I’d take a shot at capturing Andromeda. 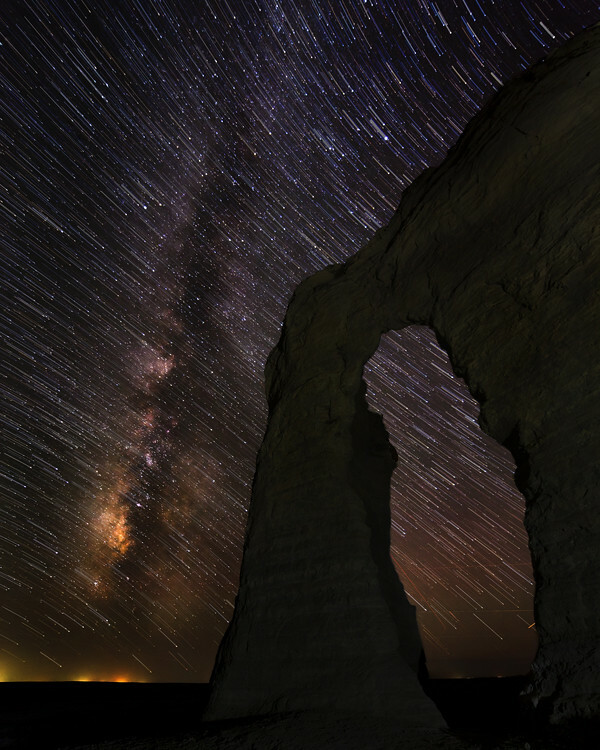 I had a fairly good idea where it was located in the sky thanks to the 14mm shot from the monument rocks I posted a few days ago as well as my buddies good skymaps on his phone. After a few 30 sec exploration shots I was able to get it in the shot with my 85mm 1.8. I chose this lens because it was the fastest lens I had with the longest focal length. I was originally going to post this image on Tuesday but it was quickly given a back seat to my northern lights shots so I’ll go ahead and post it today. Back up at Monument Rocks again. This time we are looking north away from the core of the Milky Way. Because the Milky Way runs SW to NE at this time of year, it still passes through this shot, but it is the outer region of the galaxy and it is much more difficult to see. The cool thing about this shot (and I didn’t see it until I processed it) is not only is Jupiter in this scene (the brightest “star” in the sky), but if you look directly above the head of the dog you will see another galaxy, Andromeda. Andromeda is a spiral galaxy much like the Milky Way. 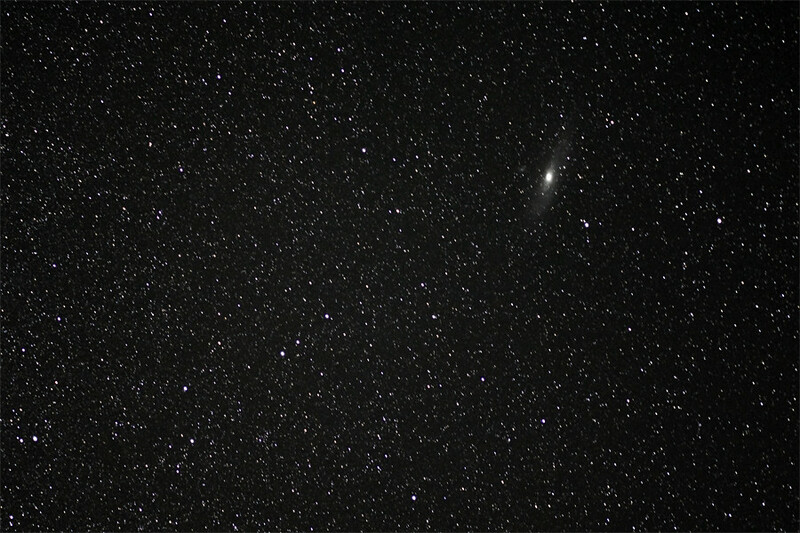 If you search for a picture of Andromeda, you will be able to appreciate the core in this shot with a hint of “haze” extending out from the core which is the spiral aspect of the galaxy. Didn’t think I would be able to pick that up at 14mm. This is my first attempt at a star trail with the milky way. On this one, I didn’t simply lighten all the frames to create a blurred streak of stars and colors. I ended up processing the final frame like I would any other milky way picture and then I just dropped the opacity on the star trails layers on top of the processed shot. Something a little different. Hope everyone has a great weekend filled with amazing light. 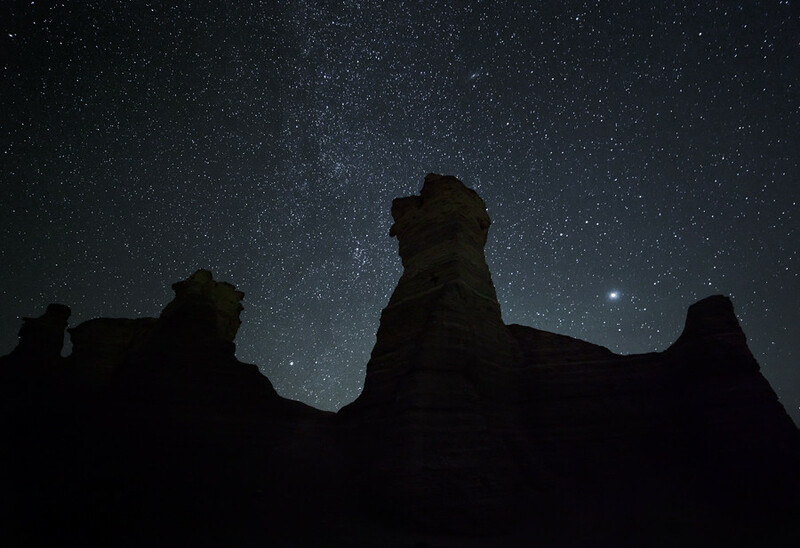 Today’s post takes us back up to the Monument Rocks. There are so many different formations and peaks, the composition choices are endless. These rocks are on the eastern range of the two sets of rocks. The “camel” rock as I call it, is the furthest south. 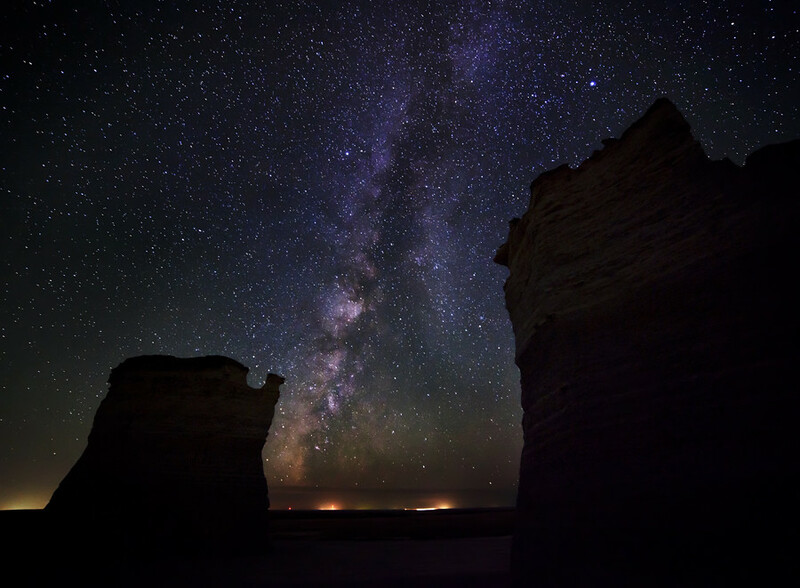 I’m definitely going to have to you use that rock formation for a time-lapse next summer when the Milky Way will rise higher in the sky.